Cost to install a retractable awning varies greatly by region (and even by zip code). Get free estimates from awning specialists in your city. Cost to install a retractable awning varies greatly by region (and even by zip code). How much does it cost to install a retractable awning? Retractable awnings can be found as weatherproof fabric options or as lightweight aluminum designs. They are sold in many home improvement stores as pre-fabricated kits, but will generally run on the small side - such as 4'x24'. For the purpose of this discussion we will take a look at the costs and requirements for having a retractable (fabric) awning professionally installed on a modern home. According to AwningTime.com, the average costs for the installation of a retractable awning 1 in sizes ranging from sixteen to thirty feet wide are $175 to $300. They also indicate that hard wiring of an electronic motor will come in at a cost of roughly $80 to $150 total. Can't the homeowner just install the retractable awning 1 on their own? This is certainly an option, but the stresses of wind and weather along with electrical requirements usually put such a project strictly under the "professional contractor" category rather than a DIY one. 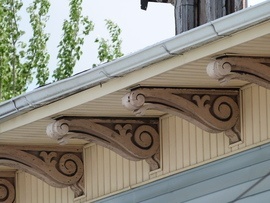 Labor - although many home improvement stores sell pre-fabricated awnings or make custom awnings available, they don't usually extend installation services. Additionally, most custom awning manufacturers do not offer access to licensed installers as well. This means that the homeowner will have to seek out a qualified "handyman" or carpenter to tackle their installation. These professionals tend to charge between $40 and $60 per hour, and they may not be able to hard wire the electronic motors. This means that a licensed electrician may be required as well, but this task will usually require no more than an hour's time to complete. This usually means from $70 to $90 for the complete job. Measuring - many homeowners believe that they can properly measure the area where their retractable awning 1 will be installed, but this may not be a good idea. The weight of an awning, the space needed for the motor and other features, and clearance requirements around doors and windows all add up to the need for some professional guidance or assistance when measuring. How much does it cost to install a retractable awning in my city? Cost to install a retractable awning varies greatly by region (and even by zip code). To get free estimates from local contractors, please indicate yours. Cost Considerations: Kits are available at various retail stores, but generally run small (4'x24'),and most are manually retractable. They run from $250 to $1,000. 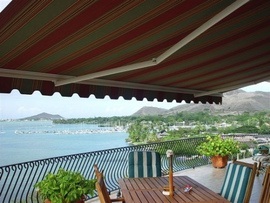 Retractable awnings that are motorized generally cost $1,000 to $4,000.